Moderators started the protest after one of the site’s key staff members was dismissed without providing a reason. 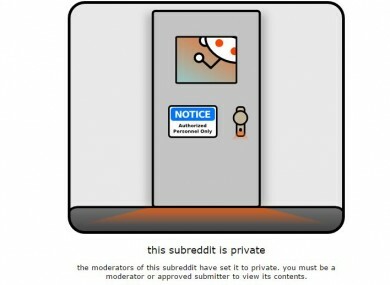 MODERATORS FOR REDDIT have shut down a number of the site’s most popular sections in protest after one of its staff members was dismissed. Victoria Taylor was a key member of the company’s behind the scenes team and was one of the site’s most visible members. She was involved in a number of subreddits, but was the point of contact for the site’s Q&A subforum or subreddit r/IAmA, where she would organise sessions with celebrities, public figures and other interesting people like US President Barack Obama, Channing Tatum, Bryan Cranston, and Neil Degrasse Tyson. Her dismissal means that the moderators for this and similar subreddits are left without the ability to make these interviews happen, including ones that are currently scheduled. In protest, r/IAmA shut itself down and has been joined by other popular subreddits like r/gaming, r/videos, r/funny, r/music and r/science. The other reason for the protest concerns Reddit moderators feeling their contribution to the site, which is unpaid, is undervalued by the company. A note on the r/music subreddit says that the relationship between the company and moderators had been deteriorating and they lack the support needed to carry out their role efficiently. Communication and support between admins and moderators has been deteriorating and basic tools such as moderator tools and modmail are sloppy at best, with constant promise for improving never coming. Communication has also been lacking as evidenced by today’s mishandled firing of u/chooter (Victoria Taylor’s username). And a similar explanation from one of the site’s many moderators in the subredddit r/outoftheloop. As much as Victoria is loved, this reaction is not all a result of her departure: there is a feeling among many of the moderators of reddit that the admins do not respect the work that is put in by the thousands of unpaid volunteers who maintain the communities of the 9,656 active subreddits, which they feel is expressed by, among other things, the lack of communication between them and the admins, and their disregard of the thousands of mods who keep reddit’s communities going. Reddit CEO and co-founder Alexis Ohanian responded to the thread saying he will be helping with r/IAmA for the time being. In a second thread dedicated to Reddit moderators, he apologised for the way the team communicated the change and said the immediate focus was on two main aims: getting the closed subreddits back online and offering greater support to r/IAmA in the short term. In the long-term, he said they were building tools to help moderators do their jobs more efficiently. Reddit is one of the most popular sites globally, but has found itself at the centre of controversy. Recently, some users expressed their anger over it banning five subreddits including r/fatpeoplehate as a way of reducing harassment and bullying on the site. Email “Sections of Reddit have been shut down over a protest”. Feedback on “Sections of Reddit have been shut down over a protest”.